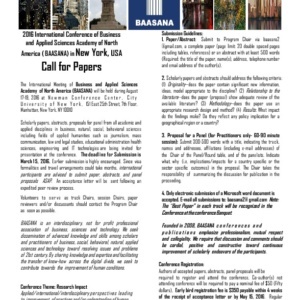 Call for Papers (2018 International Conference in New York) – Submission Deadline Extended to May 10, 2018. Attached is a list of hotels produced by search engines: www.hotels.com. Please also note that price and availability of rooms changes daily. Price listed is as of June 16, 2015. You may search hotels by using any of the following search engines for the latest price and availability: www.hotels.com; www.expedia.com; www.orbits.com, booking.com and the like. With the above search engines cheaper/affordable accommodations may also be found in Queens and Brooklyn with easy access to mass transit. It is possible to arrive at the Conference center within 20-30 minutes by mass transit from many hotels in Queens and Brooklyn. Please note that New York City map, City Transit map and Tourist Guides may be obtained by using Google searches. results and analysis of which will have implications or relevance to policy makers and practitioners in relevant fields. IJBAS gives priority to empirical/analytical research papers. The field of business and applied sciences is a complex one. It is influenced by the many social, technological and economic changes evident in the world today. the engine of growth in any economy. This issue presents some very interesting papers. 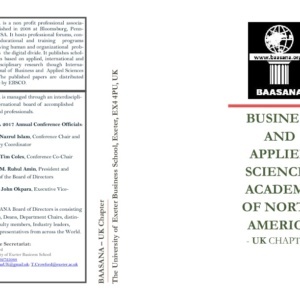 The International Journal of Business & Applied Sciences(IJBAS) is a double-blind reviewed journal of Business and Applied Sciences Academy of North America (BAASANA) that provides guidance for those involved at all levels of business and applied sciences. The journal publishes research papers, the results and analysis of which will have implications or relevance to policy makers and practitioners in relevant fields. IJBAS gives priority to empirical/analytical research papers. The field of business and applied sciences is a complex one. It is influenced by the many social, technological and economic changes evident in the world today. I am delighted to present this issue of the International Journal of Business and Applied Science(IJBAS). This is the first issue of IJBAS under a new Editor-in-Chief. The new Editor and the Editorial Board intends to maintain its current image as one of the leading inter-disciplinary academic journals. The Board is committed to taking this journal to a new level by building IJBAS into an internationally ranked academic journal that rivals its peers. This special issue includes four articles addressing Corporate Ethics and Behavior of Managers, Plant-level Environmental Performance and Owner Firm Characteristics, Determinants of the Annual Earnings of the LPGA and PGA Golfers, and Cross-Cultural Management. 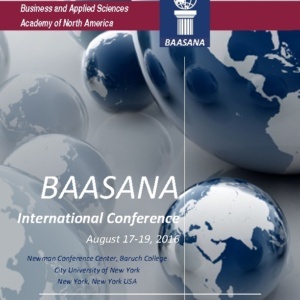 Papers or abstracts are not required for attending BAASANA conference. 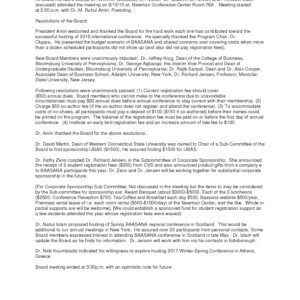 Practicing professionals (non-Faculty) may elect to attend only part of the conference by paying (substantially reduced) special registration fee. All payments are to be made to: BAASANA, Care: Dr. Amin, 2201 Bentley Drive, Bloomsburg, PA 17815 USA.